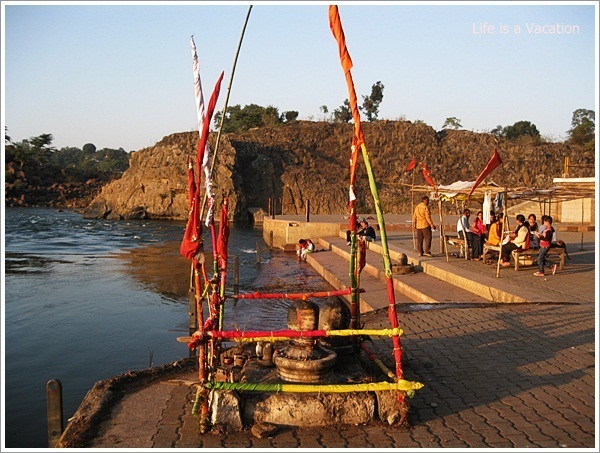 A trip to the Bhedaghat area of Jabalpur is incomplete without a boat ride on the Narmada through the high cliffs or the marble rocks. 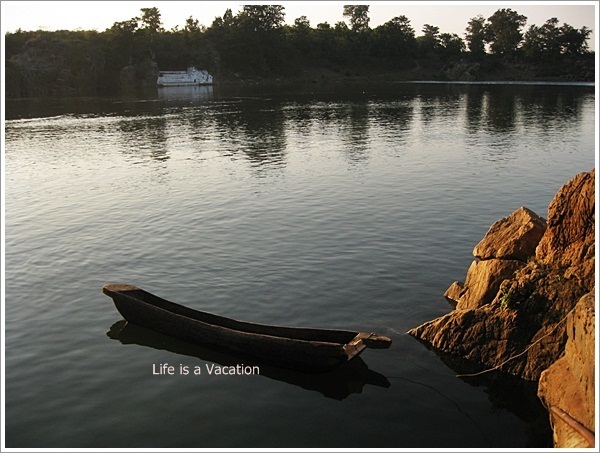 It is a rather rickety boat ride with a group of 10-12 people on the quiet Narmada through the 3km long gorge that runs between the high cliffs (approx 100 feet). As the boat moves, the white cliffs streaked with green and brown volcanic rocks shimmer under the sun light. The boat man narrates a story of love in a comic style accompanied by some off tune latest remix which generates amusement and laughter. At some point during the ride, the Bandar Kodini point can be seen where the cliffs come so close that monkeys are able to jump across. I did not notice a monkey but a young boy of 10-12 who dived down into the water from a cliff top all for a 10 Rupee which he wanted in exchange of his carefree dare devil act. Bandhavgarh and Kanha National Parks which are famous for sighting the Tiger in the Wild are within 3 hour driving distance from Jabalpur. The city is connected to larger cities through rail and air. Thanks Shweta. It was not so easy sitting in a rickety boat trying to protect the camera. It seems to be an amazing place particularly the boat ride. You are perhaps very lucky to travel across India leaving the cubicle behind. Wow, Interesting informative post! such great post.. all the pictures looking beautiful and charming. really, i like your travel experience…. Beautiful post of a beautiful place! You took me back in time! I visited the Marble Rocks way back when I was seven or eight. We were on our way to Kanha. 🙂 I am sure the boat man still sings the same Dharmendra – Hema Malini songs even now. Ha ha. Maybe! We had a funny crazy moment. My dad insisted on trying to row the boat and we nearly crashed into the rocks! Brought him down from superman status for me, the adoring daughter. Lovely post…and the photographs are really nice! Ur narration, i would say, was better than the pics which btw were very candid. That pic of the boy taking the plunge is the real deal here. Beautiful and mesmerising captures. Brilliant! Interesting to know.